website had a few changes with having the image be seen at the same time as the definition and I fixed “hyberbole” and also put in intrinsic and extrinsic ethos. and with the gun poster i went back to my original by taking out the caption which i thought was unnecessary because it didn’t really add much. the image really just speaks for itself and clearly demonstrates topic of the poster. This entry was posted in aiga gun control poster, applied communication theory, spring 2013, website design on May 14, 2013 by briannadallas. the dominant mode of appeal would be pathos. the gun being wrapped in caution tape plays with the imagination. the imagery alludes to, and makes your mind picture, crimes scenes and other dangerous situations. the poster uses the rhetorical trope of synecdoche. 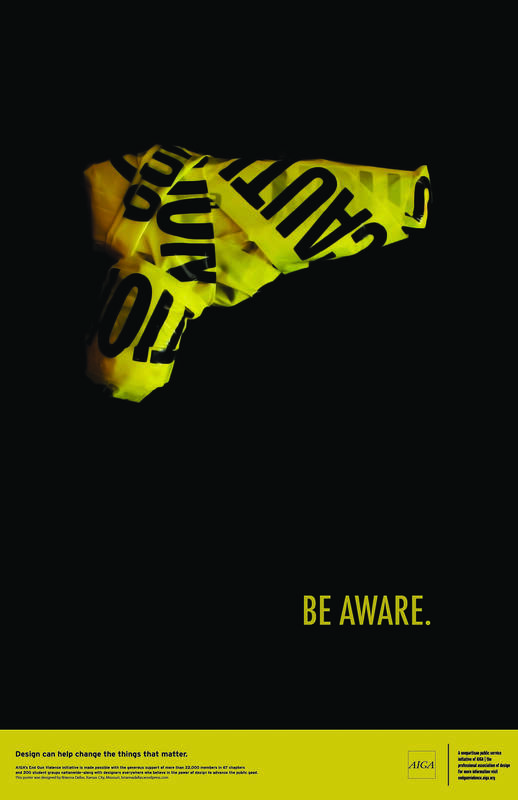 the viewer is given a piece of information with the gun and caution tape, for which they are left to use their knowledge to make connections to the more complex scenarios that demonstrate the consequences of guns. there is also a bit of a pun with the wording, another word for caution can be beware. and in this case for gun control we also need to “be aware” of the dangers surrounding gun usage. maybe that’s stretching it. i believe the design’s simplicity is bold and gives off a clear, straight forward message. This entry was posted in aiga gun control poster, applied communication theory, modes of appeal, rhetoric, spring 2013 on April 2, 2013 by briannadallas. rhetoric catches your attention, then aristotle’s modes of appeal pull you in closer and keep your attention. modes of appeal focus on the details that give a message substance and really define what is being communicated. ethos applies to the credibility of the source, pathos applies to the emotions and senses, logos applies to the brain’s need for logical and stats to back up a claim; all three of the appeals make a message believable. modes of appeal are present in all realms of design, every form of design is going to at least appeal to the senses and emotions through the simplest choice of color or typeface, so therefore contain pathos. rhetoric makes you think and use prior knowledge to form the clever connection. rhetoric works best with a clear and concise message being supported with vivd imagery. advertising is bursting with rhetoric. humor easily fits into a range of rhetoric forms, it’s seen in commercials from car insurance to fast food. a specific one i’m thinking of are the allstate commercials. they use metaphor for mayhem while sneaking in a bit of parody; the message is made very evident. rhetoric makes something more interesting, humans are attracted to the explanation of abstract concepts. This entry was posted in aiga gun control poster, applied communication theory, rhetoric, spring 2013 on March 26, 2013 by briannadallas.